Victron Blue Smart Bluetooth 12-volt 30-amp single output battery charger with IP22 rating suitable for AGM, Gel and Lithium Ion battery charging (AU/NZ model). Bluetooth Enabled - The Blue Smart IP22 Charger is the wireless solution to monitor voltage and current, to change settings and to update the charger when new features become available. Adaptive 6-stage charge algorithm: test - bulk – absorption - recondition – float – storage. 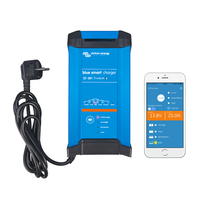 The Blue Smart Charger features a microprocessor controlled ‘adaptive’ battery management. The adaptive feature will automatically optimize the charging process relative to the way the battery is being used. Storage Mode - less maintenance and aging when the battery is not in use. The storage mode kicks in whenever the battery has not been subjected to discharge during 24 hours. In the storage mode, float voltage is reduced to 2,2V/cell (13,2V for a 12V battery) to minimize gassing and corrosion of the positive plates. Once a week the voltage is raised back to the absorption level to ‘equalize’ the battery. This feature prevents stratification of the electrolyte and sulfation, a major cause of early battery failure. Li-ion (LiFePO₄) batteries - LiFePO₄ batteries are charged with a simple bulk – absorption – float algorithm. 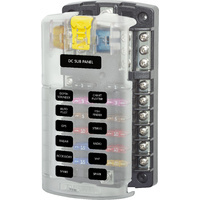 NIGHT and LOW setting - When in NIGHT or LOW mode, the output current is reduced to max. 25% of the nominal output and the charger will be totally noiseless. The NIGHT mode automatically ends after 8 hours. 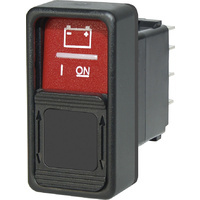 The LOW mode can be ended manually. Protected against overheating - Output current will reduce as temperature increases up to 50°C, but the Blue Smart Charger will not fail. Eleven LEDs for status indication - Charge algorithm: TEST / BULK / ABSORPTION / RECONDITION / FLOAT / STORAGE / READY. This product is ideally suited for single house battery applications as found in a caravan. For a boat where you wish to charge a house battery bank and a starter battery at the same time, we recommend the three output version Victron Blue Smart Bluetooth IP22 Battery Charger 12/30(3).